Estacada students Dale Barrett, Derlene Todd, Tim Graham, Vicki Reynolds and Dan Robertson had been selected to participate at the "Music in May" Festival in Forest Grove. The event was sponsored by Pacific University and consisted of a five day conference where top music students from across the state received extensive instruction. Items on the Estacada Grade School's lunch menu included meatloaf, hot dogs and macaroni salad. At Linda Kay's Dress Shop, all remaining winter coats, winter housecoats and long dresses were 50 percent off. Classified advertisements from 40 years ago included hay for sale from Perry Farms, cattle buying and hauling offered by Jack Hashagen and 16 market hogs for sale. An Estacada parent, angry about a possible insult or physical attack that another student perpetrated against his child, threatened to "blow up the grade school." Grade school principal Paula Stewart met with the parent, and a deputy from the Clackamas County Sheriff's office advised about him about making "extravagant threats that can alarm innocent people." Betty White, a five year employee of Estacada Funeral Chapel, had recently been promoted to director and manager of the establishment. White had worked in the funeral business since 1989 and came to Estacada in 1993. "It amazes me at this age (56) that I did this," White said, encouraging people to pursue their goals no matter where they are in life. 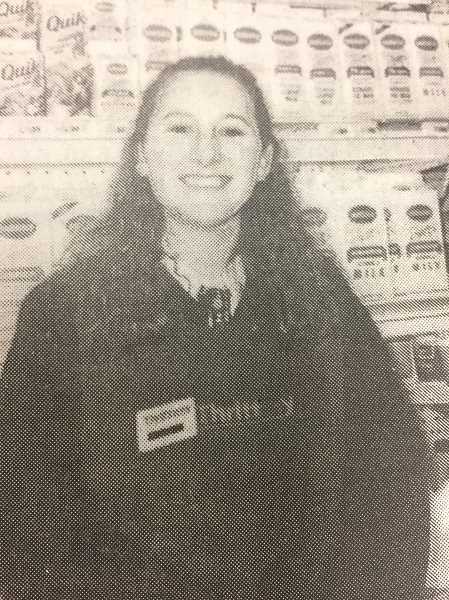 Missy Julien, a senior at Estacada High School, was the associate of the week at Estacada Thriftway. "I play soccer through school and as a hobby," she said. "Also I like to try new things and I enjoy working in the garden with my mother, Cindy. I plan on attending college after high school and going on some trips." When Oregon Spectator reporter Mark Luedtke refused to leave an Estacada School Board executive session, deputies from the Clackamas County Sheriff's Office responded to the call from the Estacada School District. Though Oregon law does not allow members of the public to attend executive session, members of the media are typically permitted to be there. Luedke said school board chairman Jay Alvaro denied him access to the session because Alvaro didn't recognize The Spectator as a valid newspaper. Though there had been no print issues for several years, editor and publisher Ralph Hartley said The Spectator had established an online presence. In a statement, school board members wrote that they were required to allow executive session admittance to, "representatives of the news media that regularly (on a weekly basis or more often) report on educational and procedural matters related to school districts and their boards of directors . . .(the) authorized media entity must have a regular circulation of a reasonable number of recipients per issue." Luedtke eventually left the session but maintained "that it was his constitutional right to attend." "How does the school board post their agenda (and) distribute policies that are being promoted?" he asked. "How do they communicate everything between the district and the board? It's all electronic. How, then, can they condemn the internet as a means of communication for the media?" One of Estacada's four-legged residents had recently gone for a stroll around the neighborhood. Lincoln, a 15-year-old Scottish Highland bull, has lived with Misty Winsor and her family at their Estacada property for more than four years, and he enjoys exploring. "He cuts right through the fencing," Winsor said. "He's a little Houdini. In spite of our continued great efforts to keep him in, he continues to find ways to get out." But no one seemed upset with Lincoln's visits. "He's the epitome of a gentle giant," Winsor said, describing him as "an overgrown Ewok." "He's not what you'd think of (when you imagine a bull). He's very docile," she added. She added that they're considering finding Lincoln a girlfriend in hopes of inspiring him to settle down. "She must be cute, friendly, enjoy long strolls around the property and hopefully able to keep her man at home," she said.